Joey Logano nearly found himself out of NASCAR after he failed to meet the unrealistic expectations that were thrown on him earlier in his career. Now, he is a Monster Energy Series champion. Logano started his Cup career behind the wheel of the famed No. 20 Joe Gibbs Racing machine that had won 33 races and two championships with Tony Stewart behind the wheel. Sure, Logano won a couple of races, but his first four seasons were at the best substandard, especially considering the unrealistic expectations that were thrown on him. Everyone thought this kid was going to be a championship contender from the get-go, but that was not the case. His average points finish in his first four Cup seasons was 19th. Ex-driver Kyle Petty even said before a TNT broadcast (I believe it was in 2012) that Logano could potentially end up like Casey Atwood, whose two wins in the 2000 Busch Series (now Xfinity Series) season were good enough to earn him a full-time ride in the Cup Series in 2001 when he was just 20 years of age.. Unfortunately, the move turned out to be horrendous. Atwood accumulated one top five and three top 10s in two full-time seasons with Evernham Motorsports, finishing a dismal 35th in points in 2002. Atwood’s career went nowhere after that. When it was announced in June 2012 that Matt Kenseth was going to leave Roush Fenway Racing at the end of the year, Logano became the odd-man out, and many people believed that Logano would end up like Atwood. However, one man with an eye for talent, and years of success in building championship winning race teams across multiple forms of auto racing, took a chance on Logano — Roger Penske. JGR tried to keep Logano and add a fourth Cup team if sponsorship could be found. Ultimately, their final offer was a part-time Cup ride and a full-time Nationwide (now Xfinity) Series ride, for which Logano had no interest. The 2013 season was a massive turnaround for Logano. He won at Michigan, qualified for the Chase (now The Playoffs) for the first time in his career, and led a then-career-high 323 laps. Moreover, Logano accumulated 11 top fives and 19 top 10s, compared to just two top fives and 12 top 10s in his final season with Gibbs. When Logano was just 16-years-old driving in the X-1R Pro Cup Series, all-time great Mark Martin dubbed him (as the greatest thing since) “Sliced Bread.” However, it was not until the 2014 season that Logano started to live up to that name. Logano won five races and qualified for the Championship Four to battle for the title at Homestead. Unfortunately, a series of unavoidable pit road blunders cost Logano a shot at his first championship. Logano added six wins in 2015 but failed to advance to the final four after he was wrecked intentionally by Matt Kenseth at Martinsville, in the semifinal round of the playoffs. He returned to the Championship Four in 2016 but finished as the series runner-up. 2017, however, was a disastrous season for Logano. He won at Richmond, but the win was “encumbered” due to a rules infraction, meaning Logano was not allowed to use the win to make the Playoffs. He failed to win another race and missed the postseason for the first time since 2013. 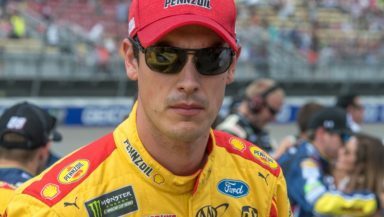 But since the incident with Kenseth, it appeared that Logano had lost some of his aggressive edge, perhaps wary of how his competitors would react. But with a championship berth on the line, vintage Logano came out to party, booting then-defending series champion Martin Truex Jr. out of the way at Martinsville, where he ironically lost his shot at a title in 2015, on the final turn, to win. In retrospect, it was the best decision Logano has ever made. In the penultimate race of the season, Logano crashed at Phoenix, finishing 37th. Had Truex won at Martinsville, Logano would have missed the cut for the Championship Four, and would likely be thinking today and throughout the entire offseason “What If.” Moreover, Logano and Truex finished one-two at Homestead, meaning Truex would have won back-to-back titles. But that’s not what happened. Logano went from a cautious driver back to the fearless one that made him a winner. There was a time that Logano allowed many drivers to push him around, but somewhere along the line, someone told Logano to fight back, and he has done that. Not everyone likes it, and Logano knows that. He also doesn’t care because he has the hardware to show for it. Penske does as well. He had never won a Cup Series title as an owner until he brought along two ultra-aggressive drivers with a plethora of talent — Brad Keselowski and Joey Logano. Now, both are champions. How about that?